Fires leave a trail of ashes and devastation in a burn injury victim’s life. Not only do victims suffer from painful, scarring, and disfiguring fire and burn injuries and the loss of property, but the emotional effects of losing irreplaceable family photos, heirlooms, loved pets, memorabilia, and personal documents can take years to alleviate. To rub salt in already painful wounds, victims of such fire and burn injuries suddenly find themselves without the comfort of a home to return to. 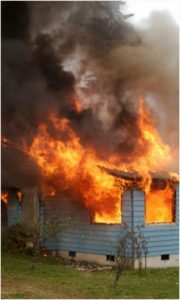 Home fires are often the cause of a burn injury that could have been prevented. Fire and burn victims must literally rebuild their lives when a fire destroys their homes. On top of the costs of replacing a home, medical bills stack up while victims are out of work recovering from their injuries. Insurance companies can be difficult to deal with. Far too many insurers are reluctant to cover the costs while families try to move forward with their lives. The National Institutes of Health define a burn as tissue damage caused by heat, chemicals, electricity, sunlight or nuclear radiation. The most common burns are those caused by scalds, building fires and flammable liquids and gases. Going it alone after suffering a fire or burn injury could risk the compensation you deserve. Many victims of fires try to handle their own property damage and personal injury cases, hoping the insurance companies will settle as promptly and fairly as they should. Unfortunately, insurance companies are profit-oriented businesses who make money by paying out less in claims than they get in insurance premiums and investing the difference. Insurers’ focus isn’t always on what is best for victims of fire. Whether the fire arose from a defective product, someone else’s negligence, or an improperly maintained property, those culprits have their own insurance companies and their team of lawyers. You need skilled and aggressive lawyers on your side and the Durham lawyers at Thomas, Ferguson & Mullins will help protect your rights to full and fair compensation. The Durham legal team at Thomas, Ferguson & Mullins has successfully resolved hundreds of serious personal injury and wrongful death claims, many of which arose from fire and burn injuries. We have obtained millions of dollars in compensation for our clients. We have an experienced staff of lawyers and paralegals who will work with you to make sure you are fully compensated for your injuries and damages arising from fires including lost personal property, living expenses while you put your lives back together, costs of your medical care, lost wages, pain and suffering, and for scarring and disfigurement. Hoping the insurance companies will settle as promptly and fairly as they should will not deliver the compensation you need.